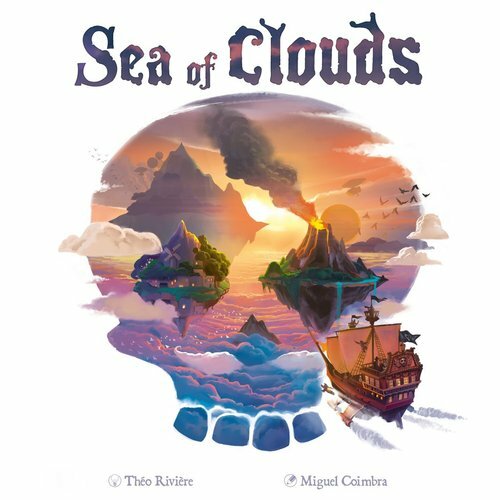 Players in Sea of Clouds vie to be the best “air pirate” around. What exactly is an air pirate? Of course, it’s a pirate who commands a flying ship! Duh. Not clear if we’re Dutchmen or not, but based on the names, I don’t think so… El Capitan, Lady Damballa, Madame Tching and Duc de Plessy take to the skies in search of plunder – whether they find it exploring or whether they gain it in plunder by boarding other ships. 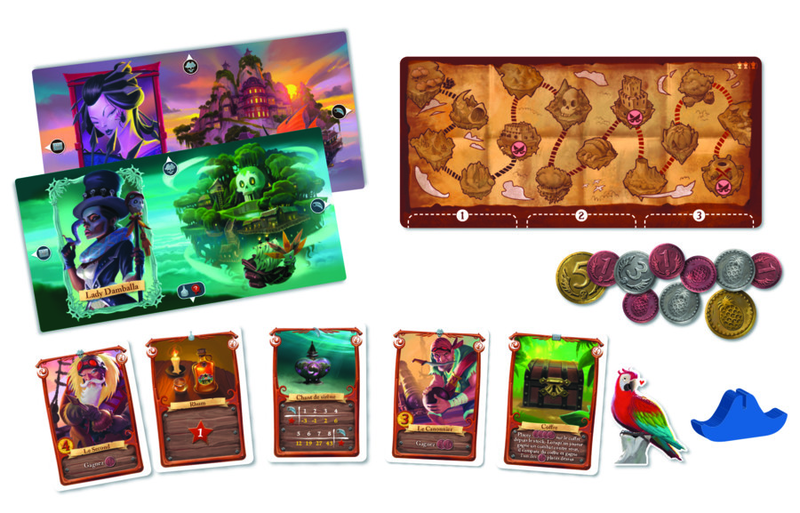 Each player gets a board whose purpose is really to show you where to put the different sorts of cards that you will collect – Pirates, Relics, Rum and Objects. There is also a central board which is used to keep track of rounds (and importantly, in which rounds you can board other ships) as well as giving you locations for the three piles of Loot. Each of the different card types has an easily recognizable colored back, so you can at least tell the type of card from a glance. Collectively, they are shuffled together thoroughly to form the Loot deck. 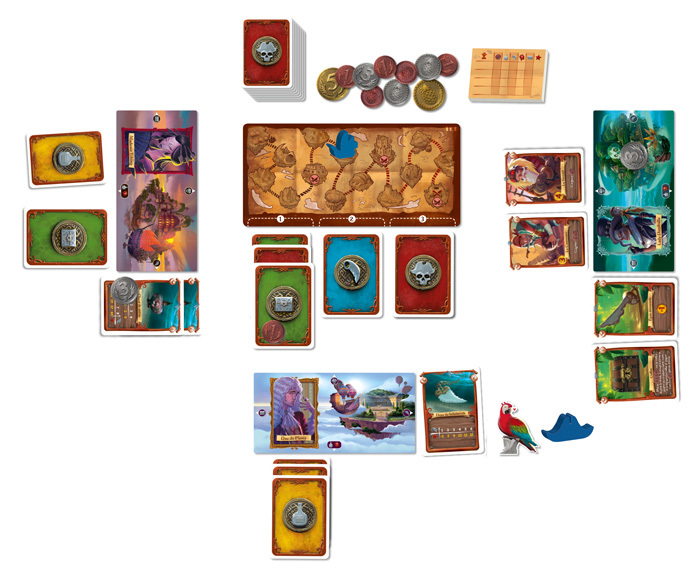 At the start of the game, one card is placed face down in each of the three Loot locations under the main board. A starting player is chosen, and that player gets the hat marker to denote that they started the game. This marker never moves, but each time that play comes back to the hat, it is a reminder to move the round marker on the central board to the next space. There is also a cardboard Parrot token which can be obtained or passed around via action cards. Whomever owns this Parrot token wins all tiebreakers, and being closest to the Parrot in clockwise order will also break ties. On a turn, the player takes the first share of Loot – that is the facedown cards on the leftmost space under the board and then decides to take the Loot or leave the Loot. If you take the Loot, you place any Rum cards and any “Secret” object cards face down under your personal board. Other cards (Pirates, Relics and Objects) are placed face up in their appropriate space. You must take all the cards in the pile and play them all. You can choose the order that you play them in – many of the cards have special actions, either one time or permanent in effect. You then place the top card of the deck facedown in the vacated spot. If you leave the Loot, you put the top card of the deck facedown on the stack – up to a maximum of three cards. If there are already three cards there, and you choose to leave the stack, you add a doubloon token to the stack. You then move to the next stack on the right and again decide to take or leave that stack. If you look through all three stacks and decide to leave them all, you simply take the top card of the deck and play it. You must go through the stacks in order – starting from left to right, and as soon as you play a card in your area, your turn is over. Play then moves to the next player clockwise. Again, when play reaches the start player, be sure to move the turn token ahead one space. Objects (green) are a combination of effects – some are end-game, marked with a secret question-mark, these are placed face down under your board only to be revealed in scoring; others with a trash can are instant use one time effects; a third type with the object symbol on them proving permanent effects for you for the rest of the game. Pirate cards (Red) have a fighting strength on them as well as a special ability at the bottom of the card that they provide if they win in battle – more on this next! At three spots in the game (end of rounds 5, 10 and 15 in a 4p game), there is a chance for a Boarding action. As the round token leaves the spot with the Boarding icon on it, there is fighting amongst the rival pirates. Each player calculates their fighting strength – this is primarily due to the strength of the Pirate cards – but can be modified by bonuses and/or penalties from other cards. You are essentially in two fights, one with your right hand opponent and one with your left hand opponent. For each opponent that you have a higher strength, you get a victory. 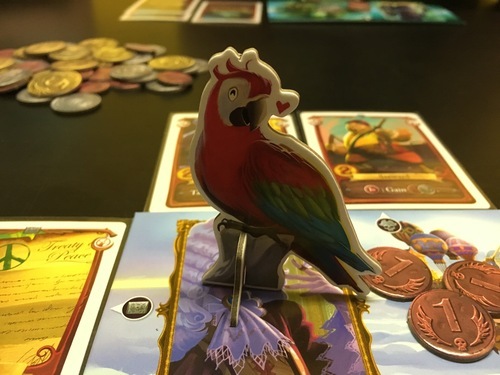 Starting with the player who holds the Parrot, you then take the effects of your Pirate cards – in general, unless specified to only happen once a turn, each Pirate card gives you its benefit for EACH of your wins in the fight. (Sadly, if you won neither battle, your pirates will give you nothing…) At the end of the Boarding phase, all Pirate cards are discarded. Each of your cards has a point value on it denoted in the red star icon or via a chart as many of the cards score based on how many copies of a card you happen to have. Each leftover doubloon is also worth a point. The player with the most points wins. Ties are broken by the Parrot. 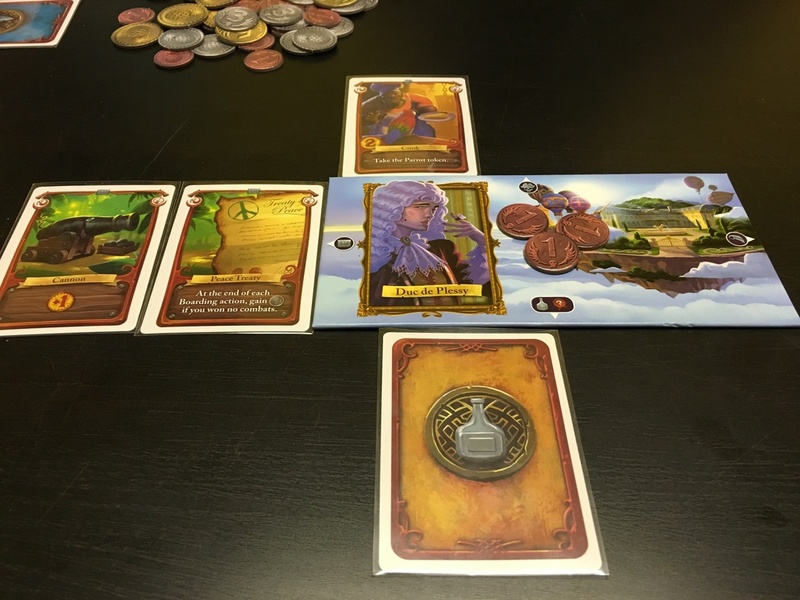 This light quick playing game has a nice mix of bluffing and tactical card play. Each of the fifteen Loot rounds is essentially the same, and provides you with an interesting choice. You are forced to look at the Loot stacks in order from left to right – but as you can see the card backs, you have a decent guess as to what you might find in those stacks. Of course, you should look carefully at each stack. Don’t forget that each time that you pass on a stack, you are obligated to add a card or coin to it – and this most likely causes it to become better for the next person to look at it. As you will know the back of the card you are adding to the stack, that might also help you decide if you want to take a pile or not. I find that this often happens if a Pirate card is on the top of the deck. If I am losing or tied with my LHO, I may not want to leave him a stack that is filled with Pirate cards as that could come back to get me in the Boarding rounds. Also, you may not want to pin your hopes on the rightmost pile because if you look at it and it is filled with cards you don’t need or don’t want, your only other option is to take a single card from the top of the deck. The scoring options seem to be fairly well balanced – you can score plenty of points for each of the different card types. Thus, I don’t think that any one type of card is inherently more valuable than any other – it’s just how they work together for you. In some ways, I wonder if this will end up being like Tokaido –a game with a similar art feel where the best play turned out to be simply taking the most turns – and the analog here would simply to be to try to collect the most cards/coins on any given turn. I think the stacked scoring of the collectible cards points against this simplistic strategy; but it’s a thought that I plan to try in my next game or two of this. The artwork is well done, and Miguel Coimbra is becoming one of my favorite boardgame artists. His work is full of emotion and layered colors (the same things I love about his art in Small World as another example). Go back and look at the cover art at the top of the review – did you notice that it makes the shape of a skull?! The iconography on the cards is fairly straightforward, and I’ve found that a quick explanation at the start of the game of the different icons is all that is needed to play the game. The publisher agrees with this as there is no player aid included in the game, and frankly, it isn’t needed. The game itself is a little hard to classify. There’s some element of drafting, some bluffing, some set collecting, some card management, and some press-your-luck. There are a handful of hard decisions to make in the game, but nothing that should slow you down. A Loot round can often finish in 60-90 seconds as players decide which stack of loot they want to take. The Boarding takes a bit longer with the strength calculations and then resolution of all the pirate effects – but as this happens infrequently in the game, it feels to zip by at a quick pace. I would think that our games will easily come in around 30 minutes as we become comfortable with the rules and the strategies. I tried this once at Origins: fun little filler, even with just 2 players, although there’s nothing shiny and new, nothing I really _loved_. But if you like push-your-luck, and pirates, and fillers with some think, this would be good! And yes, it is pretty!